Imagine the privilege of being able to look back on one’s life and take the time to own, cherish and revel in the many memories that spring to mind. Memories that define relationships, role-models, family-time, friendships, occasions and milestones, laughter and learning, and love. Memories that evoke tastes, aromas, steamy moments, heady hangovers, warmth and wonder. Antoinette’s own Life on a Table is captured within the covers of this book, and because no journey is real without companions to share it with, many, many of her fellow life travelers are captured within these pages too. Parts of their times together, shared history within a great country, parts of their growth together, parts of their moving forward and onward, and memories of hours spent sharing stories of their hearts, around so many tables over so many years. This is what Antoinette wanted to capture. Not just because for her ‘Life on a Table’ is what Life is all about, but also because she wanted everyone to know that they too can do this. Each one of you is invited to travel through this book, pick up on the memories and stories and trigger your own special memories and add these to your own Life on a Table. As a very special friend of her children, Christopher Aiff, once said, ‘Happiness is not a limited resource’. 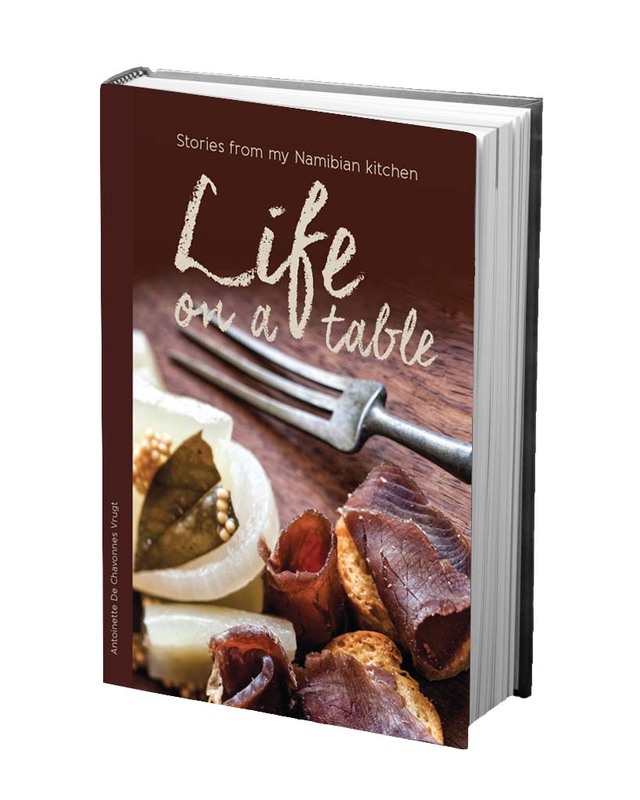 Every day, around hundreds of thousands of tables in Namibia, people are gathering together, to eat definitely, yes – but also to share their days and their lives with each other. 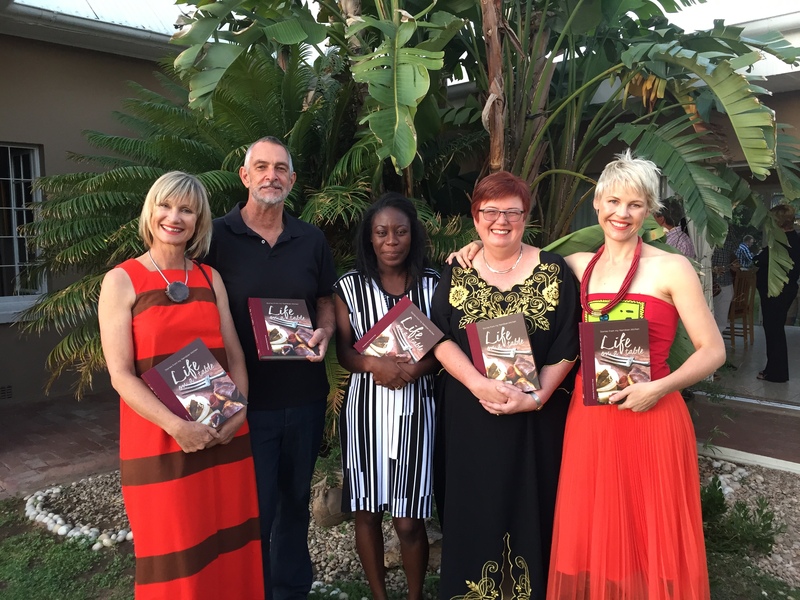 From left: Rieth van Schalkwyk, Hentie Burger (Photographer), Clara Schnack (Design and Layout), Antoinette De Chavonnes Vrugt and Christine Hugo (Editor). Books will be available for purchase at Orombonde Books, Windhoeker Buchhandlung, Foto Namibia @ Craft Centre, Jenny’s PLace, Namibia Book Market, Windhoek Book Den and Travel News Namibia office at 4 Herzinger Crescent, Klein Windhoek. For more information contact Bonn Nortje at bonn@venture.com.na. Please contact Lizelle van Staden at lizellevst@gmail.com or 083 660 4822 regarding this matter. She works with South African sales of the book. Where can I purchase copies of My Hungry Heart and Life on a Table in the United States? Also please note that the price of the book would then include the cost of postage.